The software on the client side generates communications appearing to be originating from the user to ‘camouflage’ the user’s real communications. Our current product, Camo Privacy, is a browser extension that can be downloaded from the Chrome Web Store. It protects your privacy preemptively by sending out software-generated queries and website accesses, which appear to be originating from a human user. Your genuine traffic will be blended or ‘camouflaged’ with the background traffic. The servers or anyone else will have a hard time figuring out what you are really searching for or accessing. You will not notice anything at all when you are browsing the Internet. However at the other side of the channel, some servers are trying really hard to build a profile of you, except what they are building is completely wrong. - A product was built and marketed with user recommendations. - The market could reach $20 mil because of the increasing privacy protection needs from businesses and individuals alike. 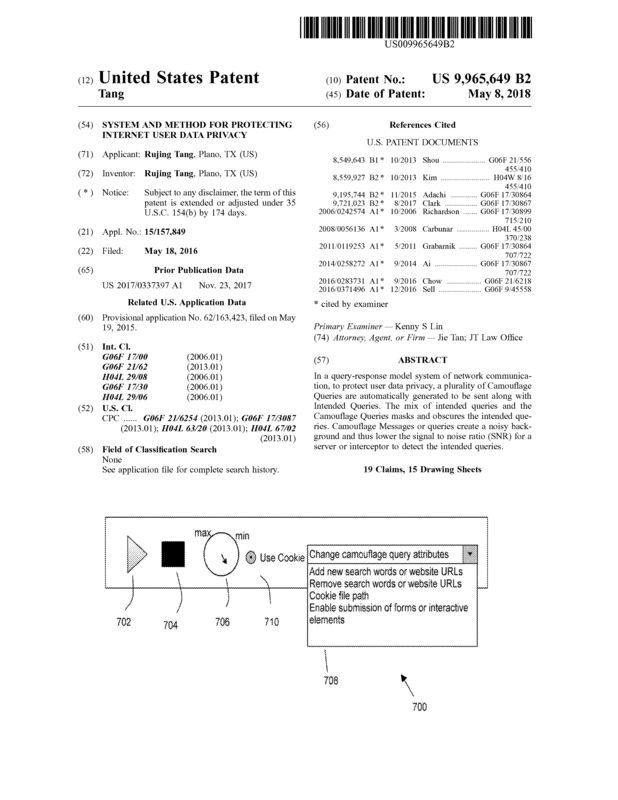 Page created at 2019-04-26 18:04:53, Patent Auction Time.